Pedestrians must not be led into direct conflicts with worksite vehicles, equipment or operations. Pedestrians must not be led into direct conflicts with mainline traffic moving through or around the worksite. Pedestrians must be provided with a safe, accessible and convenient path replicating as nearly as possible the most desirable characteristics of existing sidewalks or footpaths. Part VI of the MUTCD contains additional information on handling pedestrians in work zones. Provide detailed plans for construction and work zones. - Build new sidewalks early in multi-lane projects. - On bridges, consider building sidewalks wide enough to accommodate bi-directional bicycle and pedestrian travel (8 ft. minimum where considered needed). - When reconstructing existing sidewalks, limit work to one side of the street at a time and require all sidewalk removed to be replaced in the same day of work. 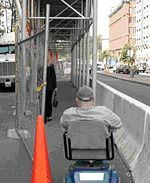 - Maintain accessible crossings at the beginning and end of the work zone. - Relocate crossings, where necessary, to provide better access and sight distances. - Plan reasonable alternate routes. - Coordinate with police departments, schools, hospitals or other public or private entities impacted. - Using signs of an appropriate scale and type to convey messages to motorists. - Limiting signs placed on sidewalk to those needed to maintain pedestrian route. 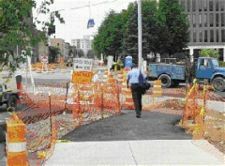 - Placing “Sidewalk Closed” signs at the beginning of a block where there is an accessible crossing point, not at the location where the sidewalk is closed. - Including temporary pavement markings for crosswalks, not just for lane lines and stop bars. - Maintaining access to functional push buttons and walk lights. 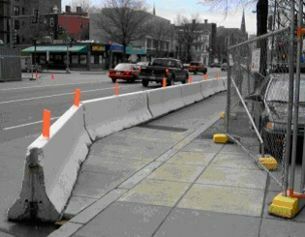 - Providing temporary curb ramps where needed. - Designing and constructing smooth, continuous surfaces through work sites by specifying and installing boardwalks. - 36-42 in. tall and continuous within 6 in. of the ground. - Continuous around perimeter of construction site or entire length of the alternate route. - Provides accessible pedestrian facilities. - Is of reasonable length. - Continues to provide access to services/destinations. - Follows a route where the volume of traffic acceptable. - Contacting facility managers, transit agencies, schools, parks, public service providers. - Developing web sites, especially for large projects, heavily used facilities and shared use paths. - Map detours and post the detours at the project site and, if available, on the web site. - Inform community of upcoming construction work via radio, newspapers, television, pamphlets, etc. Additional guidance for pedestrian work zones can be found in the MUTCD Chapter 6. This page was last modified on 6 January 2010, at 13:30.